Jewelry we have created that is in Stock for Purchase. Visit our physical Showroom for Much more. 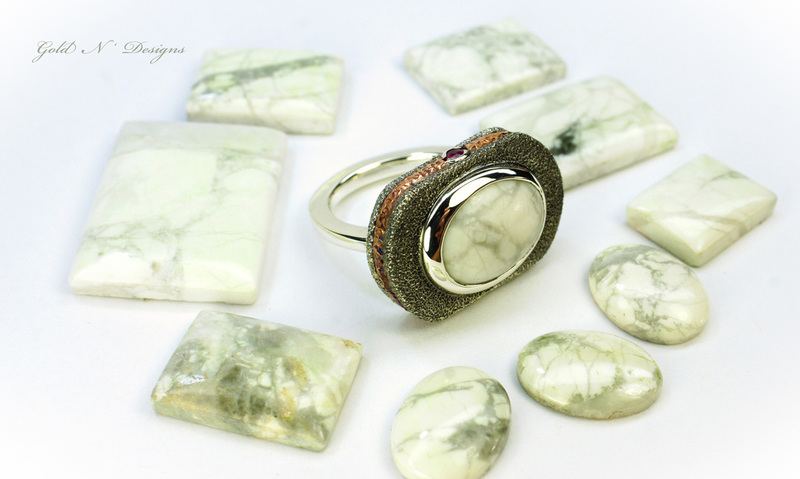 Turquoise, Sterling Silver, Copper, Statement Rings are inspired by ‘Cookies’. Natural Blue Turquoise, Sterling Silver, Copper. 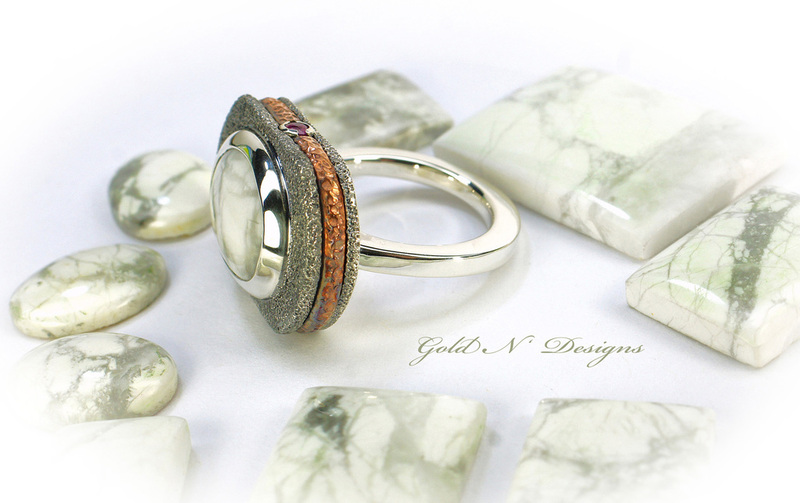 The “Macaron” Statement ring was created by Hand carving a ‘One of a Kind’ wax model. We used the ‘Lost Wax Casting’ by vacuum method for the Sterling Silver section of the ring. We Fabricated, Torch Soldered and Laser Welded the Copper sections into place. We added Wood Sawdust inside the Bezel, then Hammer Set the Natural Blue Turquoise. The Sterling Silver Bezel has a Brushed finish and the Copper has a Hammer texture finish. The top and side profile of the Sterling Silver has our ‘Pneumatic Air Scribe’ textured finish. The Statement ring is made to last and has a durable weight to last for generations. 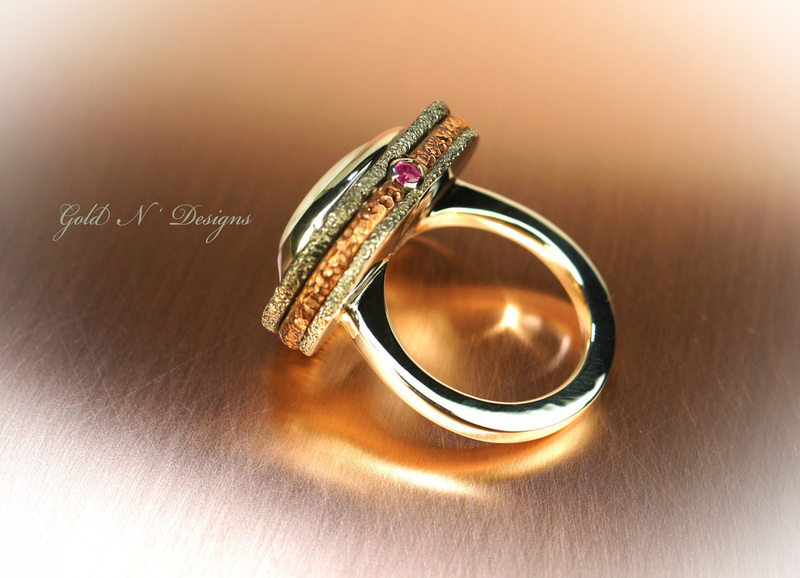 The “Macaron” Statement ring weighs 45.0 grams, Overall length of the Ring 1-1/2 inches (39 millimeters) long. The width is 1-1/8th inches (29 millimeters) wide. Turquoise measures 33X22 millimeters. White Buffalo Turquoise, Pink Tourmaline, Sterling Silver, Copper. 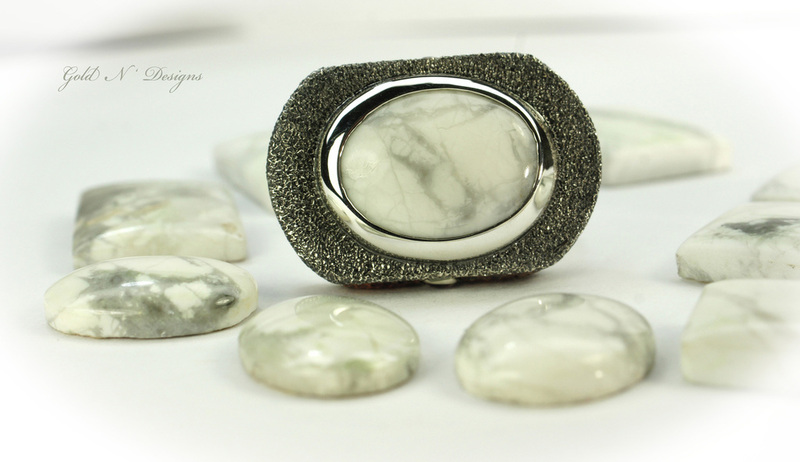 The “Lady-Finger” Statement ring was created by Hand carving a ‘One of a Kind’ wax model. We used the ‘Lost Wax Casting’ by vacuum method for the Sterling Silver section of the ring. We Fabricated, Torch Soldered and Laser Welded the Copper sections and the Sterling Silver bezels for pink tourmalines into place. We added Wood Sawdust inside the Bezel, then Hammer Set the Natural ‘White Buffalo’ (Howelite) Turquoise. We then bezel set the 2 Pink Tourmalines. 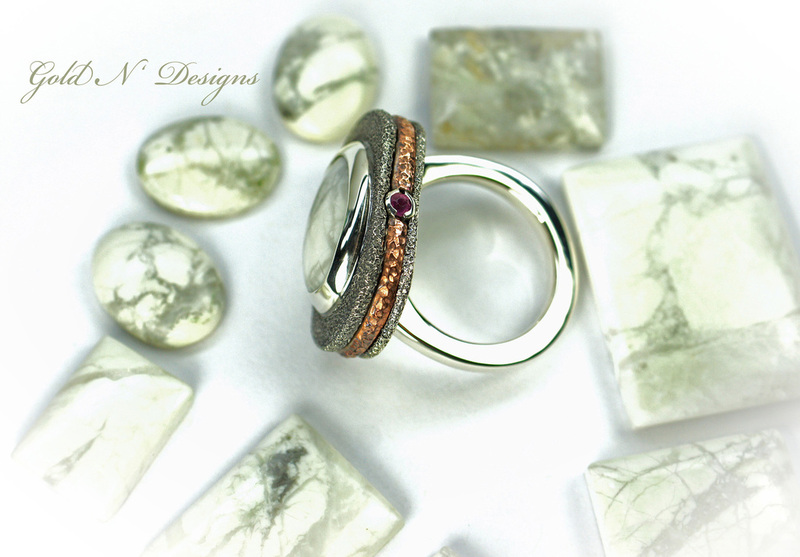 The Sterling Silver Bezels have a high polished finish and the Copper has a Hammer texture finish. The top and side profile of the Sterling Silver has our ‘Pneumatic Air Scribe’ textured finish. The Statement ring is made to last and has a durable weight to last for generations. The "Lady-Finger" Statement ring weighs 23.1 grams, Overall length of the Ring is 11/16th Inches (17 millimeters). The width is 1 inch (26 millimeters). White Buffalo Turquoise measures 16X12 millimeters. 2 Pink Tourmaline 2.5 millimeter. If you are interested in purchasing some of our Unique Jewelry Creations, you will always recieve our personal and special attention. 718 12th. AVE. NW. Ardmore, Oklahoma. 73401. You can reach us through our social media platforms as well.